It’s January 3rd. Everyone is flying high on New Year’s resolutions, many of them likely focused on healthy eating, dieting and exercise. I have made no such resolutions. Let’s be real. It’s absolutely impossible for me to even attempt to eliminate anything from my diet. I don’t possess that kind of self-discipline. Sweets? Obviously, not going to happen. Meat? I don’t eat it often, but I love an occasional burger. Insert any food you want and the likelihood of me saying that I’d eliminate it from my diet is pretty much zero. Unless you say “Brussels sprouts” or any number of other vegetables (seriously, it’s a problem). The more likely scenario is that I work on incorporating healthy foods into my diet, instead of eliminating anything from my diet. Everything in moderation, I say! I’ve always loved oatmeal; it’s such a satisfying breakfast, especially in the winter when a warm belly feels oh-so-good. 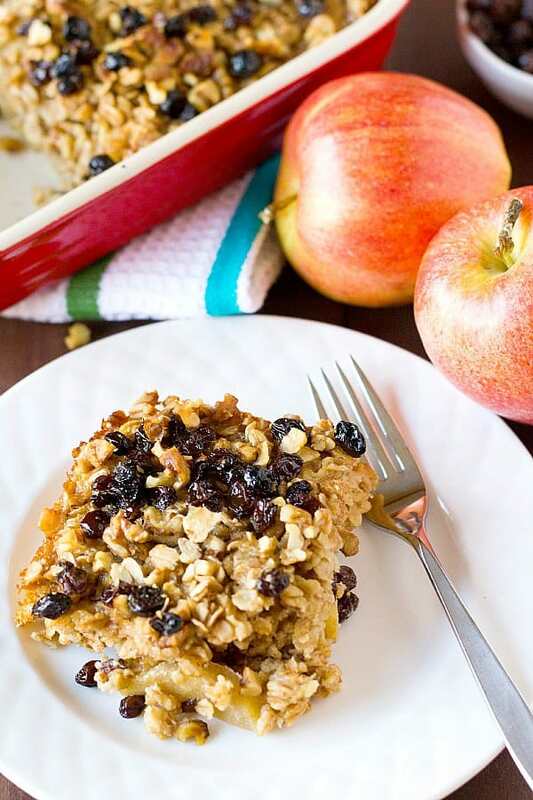 Even better is a big pan of baked oatmeal, since it can easily provide you with many servings, meaning you bake it once and have breakfast ready for much of the week… perfect for busy mornings! 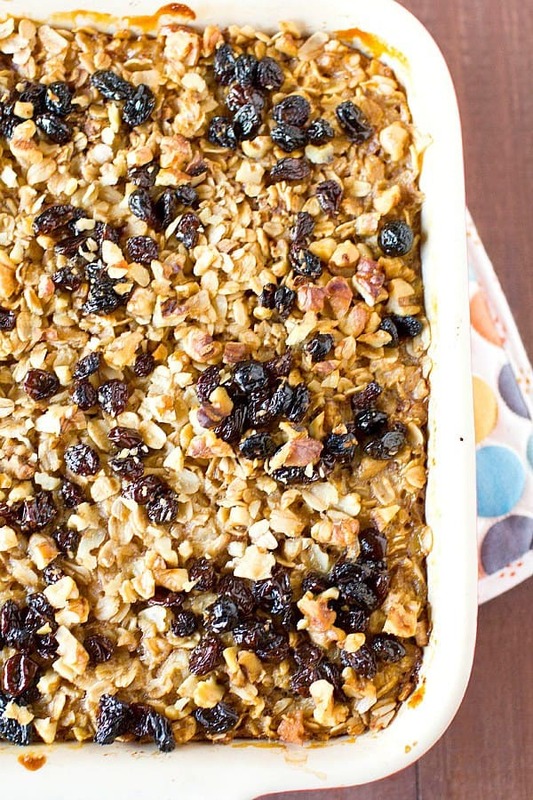 I made a simple baked oatmeal a few years ago that I absolutely adore. It’s simple, quick and delicious. However, I was still drawn to this version while flipping through my copy of Super Natural Every Day by Heidi of 101 Cookbooks. I loved the addition of fruit, as well as the creamier texture, thanks to the addition of milk. While the original recipe called for a combination of bananas and blueberries, I substituted apples and raisins given what’s in season right now. This is the perfect recipe for playing around with, and swapping out fruit combinations given the time of year and what’s in season in your area. 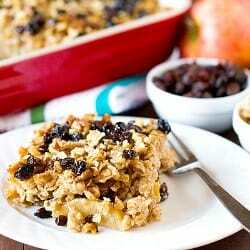 A wonderful basic recipe for baked oatmeal. Change up the fruits and nuts based on season or taste preferences. In a separate medium bowl, whisk together the milk, maple syrup, egg, half of the melted butter and vanilla extract. Arrange the sliced apples in a single layer on the bottom of the baking dish. 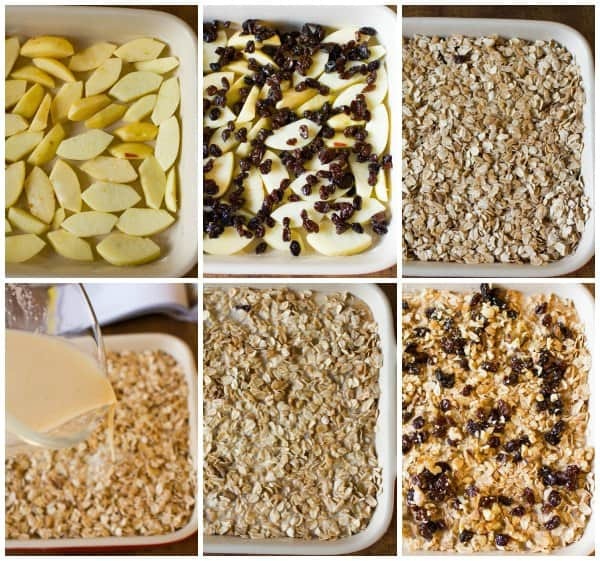 Sprinkle 1 cup of the raisins over top of the apples. 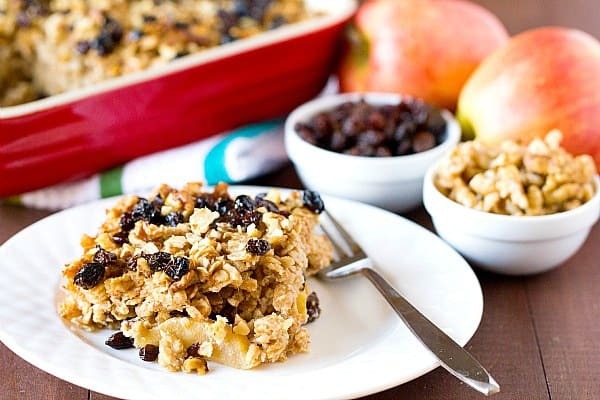 Cover the apples and raisins with the oat mixture, using a fork or spoon to spread it into an even layer. Slowly drizzle the milk mixture all over the top of the oats. Rap the baking dish on the counter a couple of time to disperse the milk among the oats. Sprinkle the top with the remaining walnuts and raisins. Bake for 35 to 45 minutes, or until the top is golden brown and the oatmeal mixture is set. Remove from the oven and let sit for at least 5 minutes. Drizzle the remaining melted butter over top and serve.